THE BIGGEST LITTLE CHRISTMAS PARADE IN THE SMOKIES will have a contingent of MINIs again this year. 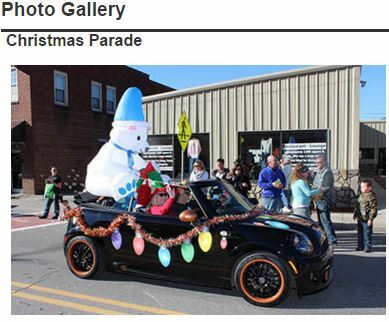 We were the hit of the parade last year with lots of decorated MINIs and this year will be even bigger. 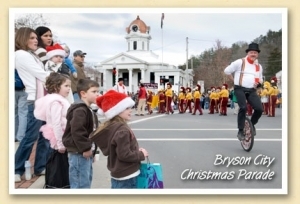 Decorate your MINI then join us as we celebrate the 43rd Annual Bryson City Christmas Parade complete with floats, marching bands, homecoming queens, and more. NOTE: There is only one Santa Claus permitted in the parade. So any costume, figurine, blow up or depiction of Santa is NOT permitted in your decoration. (Santa hats are OK). The parade starts at 2:00 but we will line up at 1:00 on Toot Hollow Rd Bryson City to do the final decorating of your MINI. At the end of the parade we will get our MINIs “Road Worthy”. Then we will make the run to the Waynesville Inn, arriving about 4:00. After checking into your rooms, we can mingle at the hotel bar (Tap Room Sports Bar & Grill) until dinner & the party.